After the second world war, Michael Klein, a holocaust survivor, came to Canada to start a new life. He tried various jobs before finding work as a butcher. 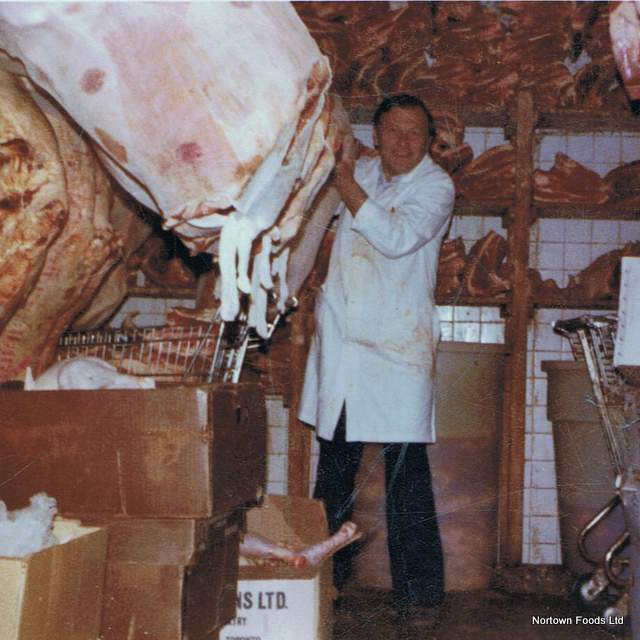 In January of 1960, with the encouragement of his wife Agnes, he opened the door to Nortown Meat Market, a small butcher and fish shop on the north side of Eglinton just west of Bathurst, in Toronto. A butcher by trade, he began the business with a commitment toward friendly, personal service, and the highest quality products at a great price. As years went on, Nortown added homemade prepared foods, deli, and a selection of grocery and specialty food items. In 1972, the store doubled in size, and took on the name, Nortown Foods Ltd. Business continued to grow and in 1977, a second location was added at York Mills & Bayview. The movement north of younger Jewish families prompted the 1987 opening of the Promenade location. Nortown is truly a family business. Early on, Mike's wife Agi, who was not only a driving force in the business, also worked at the store as a bookkeeper and cashier. While growing up, and going through school, all three of Mike's children worked part-time in the stores. They learned their father's work ethic by serving at the counters, stocking shelves, delivering orders, and working as cashiers. In 1982, Brian joined his dad, Mike, full-time in operating the Nortown stores. In 1990 Mike's daughter Marilyn, again encouraged by Agi, established So Delicious Inc., a manufacturer of premium prepared foods. Since then Marilyn joined the family business and now oversees the production of all Nortown prepared foods. This division now produces over 200 products. For the past few years, Mike's grandchildren, in between going to school, can also be found working in the family business. Jeff, Mike's eldest son, delivered customer orders while studying law. He went on to run his own successful law practice. More than fifty years later, the company is still being operated with the same underlying philosophy, and has grown into one of the most respected specialty food retailers in the city. Nortown's customer base has grown to include the children and grandchildren of the original patrons.